I am so delighted and happy to present to you the next person! :) Bogdan has done (and keeps doing!) so many wonderful things for our Romanian youths and I could not be more proud to share this interview with you all! I met Bogdan for the very first time in the Spring of 2009. We were both volunteering for a Corporate Social Responsibility project funded by Bechtel Corporation and within an AIESEC framework through their CR-Revolution project (you can check out the blog for our project here). He was one of my team mates and together with the other 6 (the name of our team and project was CSR 6.1 – 6 girls, 1 boy), we created and sustained, from scratch, workshops on ecology and photography for the kids at 2 nearby villages, using only non-formal and informal educational methods. I think it transformed both our lives because we realized that change is possible, within our grasp if we work for it with diligence and patience but mostly, that there are very willing and much needy recipients (we worked with over 60 teenagers, 12-15 year olds). And that was just the start for Bogdan. He is now the founder of “Dreams for Life”, an NGO oriented towards providing lots of opportunities for youngsters. 1. Hi Bogdan! Please tell us 5 things about yourself and what do you want to do when you grow up? But I will try. So, I am Bogdan Romanica, from Romania. I live in Cluj-Napoca, the biggest city of Transylvania and I am 26 years old. I am extremely passionate about non-formal education, youth work, personal development, reading and traveling. I have a bachelor degree in Economy, I did a master in Social Work, I wanted to be a rock star, I studied one year Landscaping, but when I will grow up I want to be a great educator, to make trainings, to write books and to inspire people to become better persons. 2. You are a youth leader and a socio-educational animateur working with youths, 12 to 20 year olds. What motivates you the most in your work and how did you develop this passion? 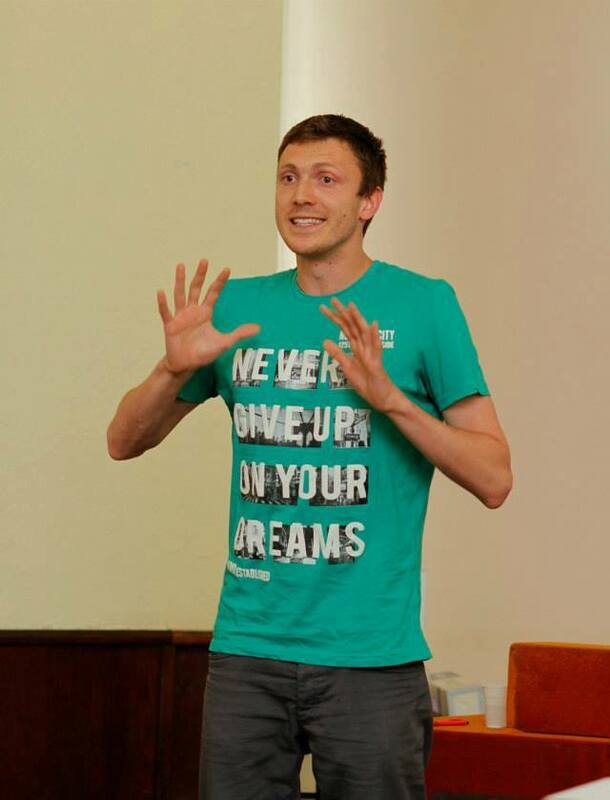 I became interested in youth work in 2009 when I was a volunteer in a project in two villages. There I worked with a great team who was passionate about education and development. They inspired me and I was very happy to work with them. That was the starting point and from that moment on I decided to dedicate myself to education. Working in the villages I felt a strong compassion for the young people who had fewer opportunities to grow. I felt the injustice and I decided to do something about it. From that moment I had a lot of great experiences connected with education! 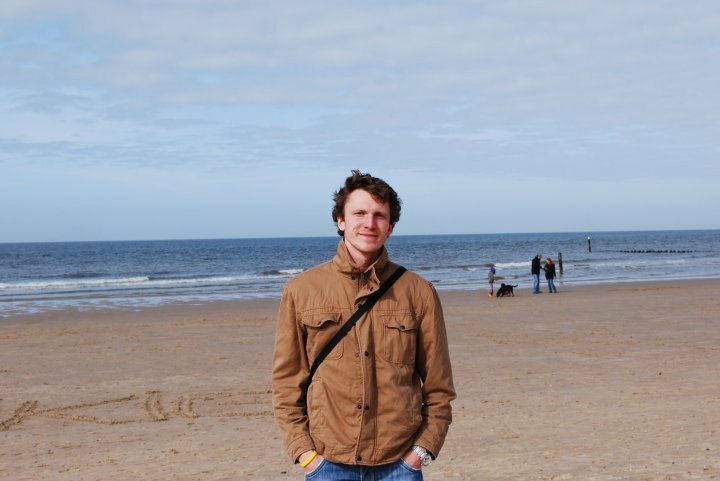 I was a volunteer in Poland and the Netherlands for almost a year. I came back and I worked as a volunteer for many organizations, because I felt and I still do that youth work is part of my life mission. There are many things that motivate me! The most important of all is the feeling that my life mission is supporting young people to grow through education. That gives me inner motivation. Other important factors are the feelings of authenticity, joy, happiness, contribution and freedom that I have when I work with the youth. These things are something that keep me fresh, alive and motivated to wake up and work. 3. What do you do when you feel discouraged and de-motivated? Walking on your path, which most of the time is always a new road (like the small road in the forest) is challenging. Sometimes you feel alone, sometimes you don’t see the results, sometimes money are hard to find, but I think I have an inner optimism and confidence for the future, which gives me strength. I also like reading personal development books, watching motivational movies and speeches (TED talks are great! ), talking to friends and daydreaming. All these things help me to go on, to take one step at the time, to believe in myself and in my mission. The positive feedback that I get from the people is also a good sign that I am on the right track and that my work has meaning. 4. In 2010, you spent 7 months in Holland by joining the European Voluntary services. There, you worked at Atlantic Bridge, a local foundation in Kruiningen. What have you learned, first as a European Volunteer and then, from your working experience there? What were your main duties, responsibilities and projects? This experience was amazing for me, it was truly life changing! When I arrived there I didn’t want to come back to Romania. I was disappointment by my country, but in The Netherlands I truly found myself discovered my personal mission, so by the end of my project, I was quite eager to come back home. In Holland I worked with youth between 14 and 18 years old. I was doing educational activities for several youth clubs from the village. Together with my colleagues I organized two youth exchanges and one international youth festival in Hungary. I was also working in different schools, making presentations regarding culture and community cohesion. Being there I have learned so many things! One important aspect was working on myself and discovering what my core values are, my mission and life principles. I also developed my social skills, I became more empathic, more patient and I developed more courage. I have learned so many things regarding other cultures, religions, beliefs, traditions! 5. 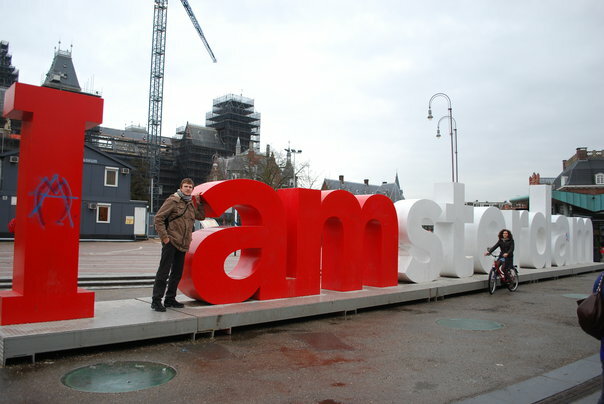 Any tips on better adjusting to the Dutch culture when traveling and visiting? What were some of its perks and most surprising things for you? I love Netherlands! I like the culture, I like the people, I like the climate, but still, it is not a culture for me. 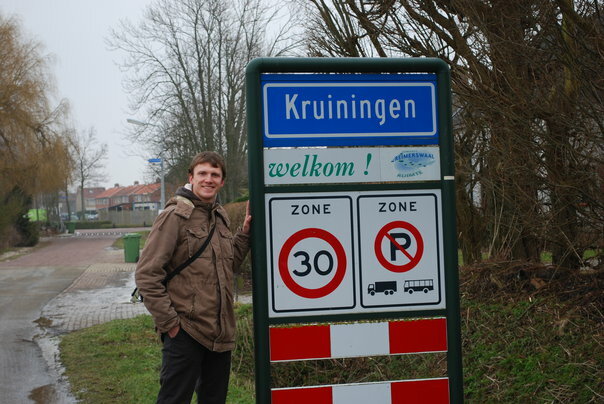 I have learned so many things from Dutch people, and I think I still have some aspects of their culture in my behavior. One important thing for the Dutch is to be punctual, to be on time. It is also good to be open-minded and flexible, because many people are very direct and straightforward towards you. I like their seriousness when it’s about work, when it’s about doing things the right way, in a very organized manner. One thing that truly surprised me it’s the multiculturalism of the country. I found many influences from many directions. Netherlands it’s like a melting pot of cultures, where different pieces of cultures are taken and transformed into a new culture: Dutch. I was impressed by the religiosity of some people, because I lived in a very Christian region, Zeeland, where I discovered a large diversity of denominations, churches and ways of practicing the beliefs. Another amazing thing that I liked was the strong relationship between people and sport, movement and a healthy lifestyle. 6. 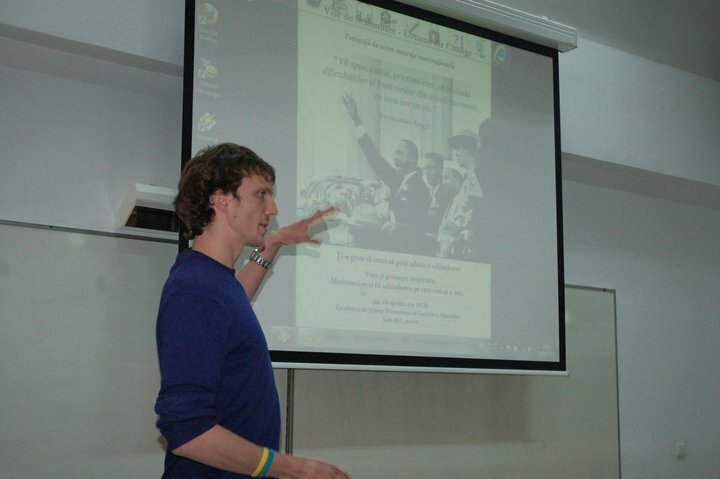 After your project ended in Netherlands, at the beginning of 2011, you went back to your hometown, Vatra Dornei, and created socio-educational workshops within the “Pro-Activ Club” for the students of Ion Luca High School. They focused primarily on developing entrepreneurial, civic and self-developmental skills. How many teens attended and what was the major outcome of the workshops? After EVS I knew what I wanted to do: youth work and non-formal education. I was still a beginner in this field, with few experiences and knowledge, so I decided to begin from my home town, step by step. There I experienced the first personal project. I organized several workshops during the weekends for the local youth. We had around 30 youth attending the workshops during a weekend. They were very enthusiastic and open to our activities, because it was something new for them. The youth gain self-confidence, more courage, creativity and teamwork skills. At the end of the project they could express themselves more openly, have more initiatives and see the world through different perspectives. In the youth club we used mainly non-formal educational activities such as team building games, energizers, activities based on communication, cooperation, creativity and role-play. We also discussed about volunteering, intercultural and global education. 7. During this time, your Foundation, Dreams for Life, was developed (even though you started working on the concept since 2009). Tell us about the vision behind it, the mission of your foundation and its main objectives and projects. Dreams for life’s mission is to support the youngsters to follow their genuine purpose in life, towards their development and the community’s. We act in order to develop genuine, autonomous, empowered youngsters to become active and responsible citizens of a society based on solidarity. We believe in a holistic education. We sustain a global and continuous education of youngsters in order to create a empower them to think and change! We like to help the development, among youngsters, of a mentality for expressing and pursuing our passions, talents, and developing them in an original and innovative manner. We also consider and respect the differences between people, cherishing different opportunities for personal and social development and growth. Our main activities are training activities, social and educational workshops through our youth club, youth exchanges with other teens from other European countries and socio-animation work. 8. What can you tell us about the needs of the Romanian Youths (and by youths, in this context, we understand 12 to 20 year olds) and how does your Foundation help address them? 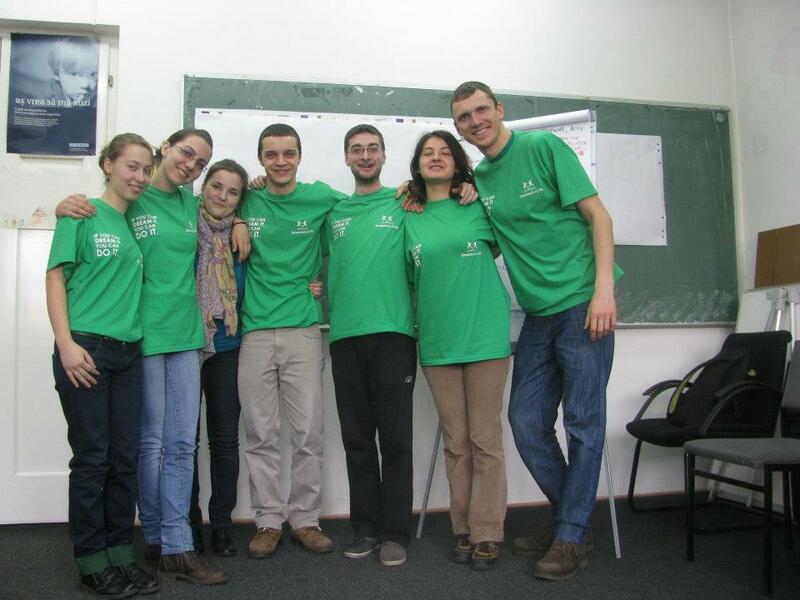 The youth in Romania are like the youth everywhere in the world, so in my opinion the needs are the same, universal. But the thing which makes the difference in each country and region is the local reality. spiritual needs (the youths are interested in more complex questions and situations, they want to think of their future, their life purpose, meaning, passions, their identity, their future). We create projects and activities through which the youths can explore these needs, understand them and find their own answers in order to feel fulfilled. We have developed one youth club (Pro-Activ) in a low ranked high school, where we discuss and act for the needs listed above. We organize trainings (local and international) and youth exchanges in order to create a learning space where the youths can develop new competencies and become more proactive in their development. 9. What are, in your opinion, their main concerns, challenges and needs? Their main concern is connected with life after school (high-school or university). Most of them are not prepared to have an independent and fulfilling life at the end of their formal studies. Many of them are concerned about having a good job, earning enough money so they can live a good life. Most of the youth in Romania, and maybe around the world, don’t work in a place where they can use their talents and passions. Many of them are disoriented, they don’t know what to do, where to go, what to dream. This is a big issue: they don’t know what to dream and how to dream or how important it is to do so! to never stop doing it, actually. 10. How could we, as parents, teachers, institutions, address their needs? I think to address these challenges and concerns we need a collective action. But there is one important issue. Most of those who suppose to change something, to educate the youth, to inspire them, cannot make it in a proper way, because they have some inner problems. Many educators are not ready to educate. They have some inner conflicts which cannot let them educate the others. 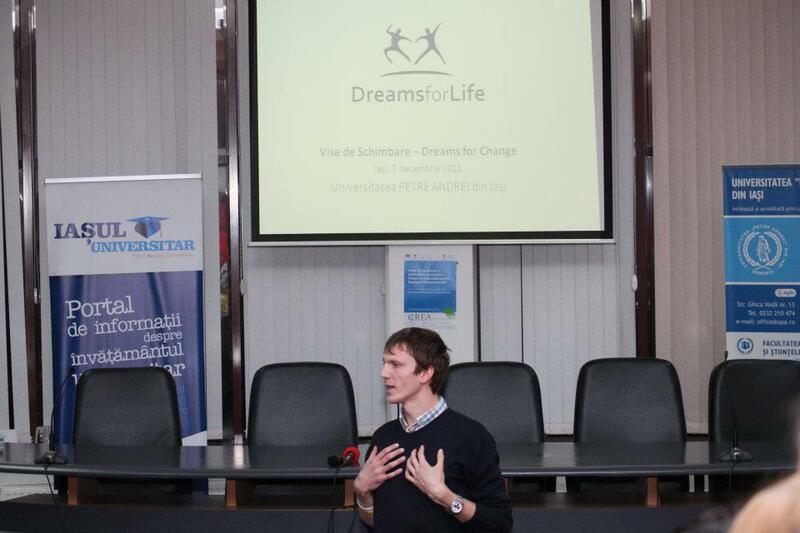 One of his awareness projects was “Dreams for Change”, 2011. 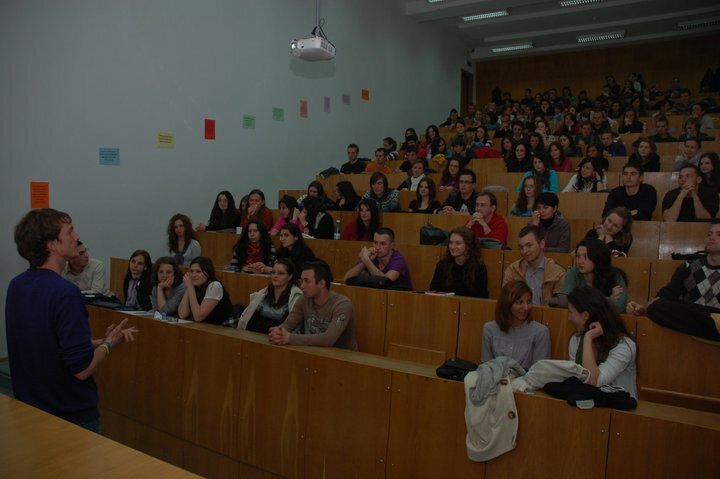 He presented motivational short videos to the students of Cluj-Napoca, Romania, to empower them towards social change and growths. Discussion followed afterwards. So, firstly, we need to fix our inner problems, to become authentic, to put the ego on the side, to be humble, to smile and to believe in a better world. The educators should be the first who set up new living standards. We should cease consumerism, we should have healthier lifestyles and then we can create an alternative to this cracked world. A youth has time in the family, in the school and the time with friends/in the community. Thus, we have three directions of influence, each very important. We should create a general responsibility and vision for education, in order to have good formal, non-formal and informal educators. 11. In your workshops, you use mainly non-formal and informal educational methods. For those that do not know, will you please explain them compared to the classical methods? Are they viable learning methods? Are they acknowledged internationally? This is a complex topic. There are lots of studies and articles made on non-formal education in comparison with formal and informal. I want though to present few principles of non-formal education, so that we can see the difference. Non-formal education represents any educational activity which is not part of the formal education (school, university) but which leads to personal and social development. Non-formal education is voluntary (because you choose to get involved in these activities), it is participatory, the learner has to play an active role in the process (to talk, to build, to run, to negotiate, to create etc. ), the relationship between learner and educator is equal (the youth worker doesn’t have the position of a teacher who has all the answers), it is focused on the needs of the participants (skills and attitudes that transcend the context and could be used in different life situations). One important aspect is that non-formal education is planned and has learning objectives. The impact of a method depends a lot on the facilitator, trainer, coach, and/mentor. It is his/her talents and passions that make the difference between a good experience and a great learning lesson. There are TONS of methods, energizers, activities, games, techniques, stories and videos that can be used so they become effective learning methods. Yes, non-formal education becomes more and more acknowledged, at least on the European level. There are also many militants who promote passionately non-formal education. European Union, through its European Commission on Youth has developed many instruments to recognize non-formal education, which by the way is quite old. Socrates was an amazing educator, the Scouts, Project Adventure, Outward Bound are just a few examples of Non-Formal Education in action. 12. Bogdan, how would you like the world to be in the future? I dream of a future where people live authentic lives and are genuinely happy, where they buy fewer clothes but more books. I hope for a future with greener cities, with more bikes and more human interactions. I wish for a world where each parent is a good educator for his/her children and where education is free and good for everybody. I dream of a world where people question life more, where the citizens are critical with the problems and where unbound creativity finds better solutions for everyone. 13. If you could say something to all the youths of the world, what would it be? Ask, question yourself, don’t take things for granted! Travel, see the world, come back home and make it a better place. Read and smile. Eat healthier, quit smoking; go in a park and not in a shopping mall. Don’t conform to the rules that others made for you, be intelligent, have courage and try. Practice your passion every day and work hard with your talent. Be close to your family and friends and make a family that can last 100 years together. Be yourself and pay it forward! You can check his foundation, Dreams for Life, here. You can also contact him there, if you have questions or would like to get involved and help or donate. Any help will be greatly appreciated. Great interview! He’s doing a very important work, helping the next generations to be better, happier and smarter. In my country, I look at the young people and most of them don’t have any expectations about the future. They don’t know what to do or even know what they want to be in future. Yes, it is, but so important! teachers, educators, especially youth leaders like Bogdan are important agents for giving the youngsters the necessary tools to get to know, develop and define themselves, whilst also providing them with the right context in which to do so. Me, being once a student given the chance to participate in an Education for Health Program in high school, similar to what Bogdan is doing with his Pro-Activ Club, I know first hand the impact of these type of educational, non-formal programs, and how much they can transform and influence your life for the better.